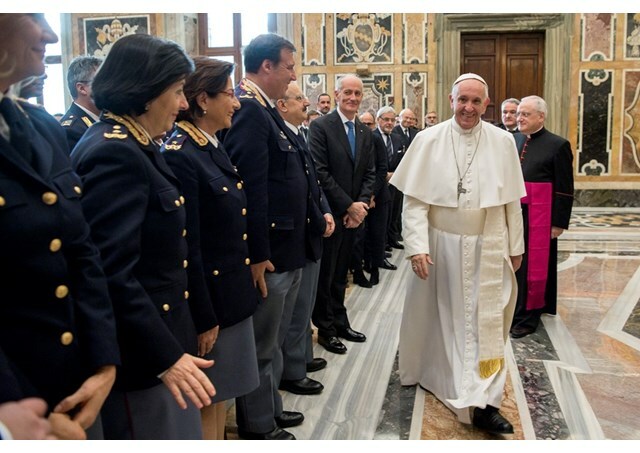 The Pope met some 100 top leaders and officials of Italy’s road police that celebrating its 70th anniversary and railway police that is marking its 110 years. I am pleased to meet you today and to talk to you, Directors and Officers of the Road and Rail Police. I thank the Chief of Police for his kind words of introduction. Every citizen should feel grateful for the work you do on behalf of the state and of the community, seeking to ensure, through a multitude of functions, the safety of those who travel on the roads and on the trains. In our world, travel is increasing, so an efficient and secure mobility has become a primary and indispensable requirement for a society that wants to keep pace with development and ensure the well-being of its members. On the streets, the task of detecting violations, regulating traffic, preventing, aiding and detecting accidents, has to deal with the increasingly complex and tumultuous reality of the streets. Alongside the shortcomings of the road system, which requires substantial investment in terms of modernization and safety, it is important to bear in mind the low level of responsibility on the part of many drivers, who often do not even realize the serious consequences of their negligence (for example through the improper use of cell phones) or their failure to observe the rules. This is caused by haste and competitiveness as a way of life, which makes other drivers appear to be obstacles or opponents to be overcome, transforming the roads into “Formula One” circuits and the traffic lights into a Grand Prix starting line. In such a context, sanctions are not enough to increase security: there is also a need for educative action, to give greater awareness of our responsibilities for those traveling alongside us. This action in raising awareness and increasing civic sense, both in the road and in the railway sectors, should draw all the possible fruits of the experience that you, policemen and women, accumulate every day on the roads and railways, in your direct contact with people and with the issues involved. The direct contact between onboard staff and the main office allows you to carry out continuous monitoring throughout the entire territory, in which the task of your managers is essential in ensuring coordination, communication of results and interaction. The rail sector is also a key area in the life of the country, which also requires maintenance and structural investment, whose inadequacy every day causes discomfort to millions of commuters and travelers, and unfortunately, as recent news has shown us, causes accidents, even fatal. What you encounter every day in the railroad is like a microcosm, passing through the most diverse worlds, with which you travel to offer security and the prevention and suppression of crime. Within the rail sector, as on the roads, police action requires a high level of professionalism and specialization, and therefore a continuous updating of knowledge of the law and the use of equipment and technology. Constant contact with people means that the measure of your professionalism is shown not only by the high skill required of you but also by a profound righteousness – which leads you to never take advantage of the power you possess – and a high degree of humanity. Both in control and suppression, it is important to rely on a use of force that never degenerates into violence. This demands great wisdom and self-control, especially when a police offer is regarded with mistrust or almost as an enemy, rather than as guardian of the common good. The latter tendency, unfortunately, is a widespread evil, which in some areas reaches the level of a clash between the social fabric and the state, along with those who represent it. Also to you, as I did with all of the Church and society during the Jubilee Year of 2015, I suggest a style of mercy in fulfilling your functions. Mercy is not synonymous with weakness, nor does it require the renunciation of the use of force; it instead means being able to avoid identifying the guilty person with the offense committed, which ends up creating harm and generating a sense of vengeance; it also means making the effort to understand the needs and the motivations of the people you encounter in your work. It requires you to use mercy even in the countless situations of weakness and pain that you face every day, not only in the case of wrongdoings of various nature but also in the encounter with those who are in need or disadvantaged. In conclusion, I refer to your patron, Saint Michael Archangel, described in the Biblical Book of Revelation as he fights against Satan, defending the woman who gave birth to the Savior (cf. Rev 12: 1-6). This biblical image makes us reflect on the ongoing struggle between good and evil, from which we can never withdraw. From the biblical perspective, this confrontation has as its first protagonists God and Satan, one representing the fullness of good and of what is favorable to man, the other incarnating evil and opposing the success of human existence. Nevertheless, regardless of the point of view of faith, it is important to recognize the reality of this clash, between good and evil, which takes place in our world and even within us. Aware of this decisive challenge, it would be unsound to consent to evil or even just to claim to remain neutral. On the contrary, everyone is asked to take on his portion of responsibility by employing all his energies to counter egoism, injustice, and indifference. We must all do this, but you are at the forefront in countering what offends man, creates disorder and foments illegality, hindering the happiness and growth of people, especially the youngest. Your service, often not adequately respected, places you at the heart of society and, by its high value, I do not hesitate to define it as a mission, to be performed with honor and deep sense of duty, serving the good of man and the common good. I invoke God’s paternal blessing and protection for you and your families, and I ask you, please, to pray for me.